Originally published under the title, "Turkey: Genocide à la Carte." 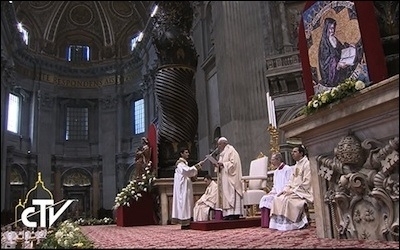 Pope Francis speaks at an April 12, 2015 Mass commemorating the centenary of the Armenian genocide. It seems as if Turkey's ruling politicians are in a race to look less and less convincing to an already suspicious international audience. How they defended their ancestors' sins a century ago earned them new points in the race, and made them look even more odd than before. The tragic events of 1915-1920 that killed 1.5 million Ottoman Armenians have been recognized as genocide by a total of 22 countries in the world, 44 states in the United States, two states in Australia, three in Brazil, four regions and three cities in Spain, two in Syria, five provinces in Bulgaria, one in Colombia, one regional parliament in the Netherlands, one regional parliament in Italy and one in Iran. The Catholic city-state, the Vatican, is among the countries that have recognized the genocide. But a papal speech on April 12 at a commemorative Mass, calling the mass killing of Armenians the "first genocide of the 20th century," deeply annoyed some very important men in Ankara. Their defense line was beyond the traditional official Turkish language based on outright denial: it featured generous doses of banality and hypocrisy. The Armenian genocide has been officially recognized by 22 countries and 44 U.S. states. Foreign Minister Mevlut Cavusoglu accused the Holy See of ignoring the pain suffered by Muslims and Turks. But Cavusoglu did not say why Muslims and Turks tend to ignore the pain suffered by other faiths and nations. In 2009, then Prime Minister (now President) Recep Tayyip Erdogan accused China of committing genocide against the ethnic Turkic Uighurs in China, after fewer than 100 of them lost their lives during clashes with Chinese security forces. The same year, Erdogan said that he went to Darfur in Sudan and did not see genocide there. Only a few months earlier, Erdogan's Islamist friend, Sudan's President Omar al-Bashir, had become the first sitting president to be indicted by the International Criminal Court for genocide and crimes against humanity that caused the death of 400,000 people in Darfur in 2005. "A Muslim would never commit genocide," Erdogan said, explaining why the man with an arrest warrant for his crimes, al-Bashir, was innocent. A more creative, jaw-dropping explanation for why Pope Francis may have uttered the word that deeply irritates many Turks came from Volkan Bozkir, a former ambassador and Turkish minister for the European Union. Bozkir said he must remind that the Pope is "in fact a citizen of Argentina." Most journalists listening to his speech silently wondered: So what. 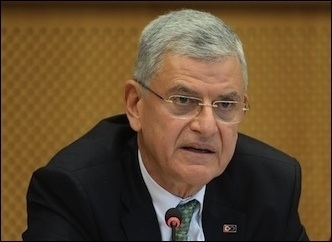 Turkish EU Minister Volkan Bozkir suggested that Pope Francis has Nazi sympathies. Bozkir further explained: "As you know, Argentina is a country that embraced the Nazi leaders and torturers ... The Pope must have had a sensitivity for his own Argentinian citizenship." According to this theory, Pope Francis, like every other citizen of Argentina, is responsible for the acts of Nazi fugitives who fled to his country. And the Nazi collaborator in the Pope (like every other Argentinian!) forced him to label the mass killings of Armenians "genocide." That is not even meant to be funny. It reveals the mindset of the people who rule Turkey. According to Professor Mehmet Gormez, Turkey's top Muslim cleric, Pope Francis's statement was totally "unfounded." That could be Gormez's own opinion, and everyone has the liberty to take him seriously or not. But Professor Gormez also claimed that there have never been missionary ambitions or colonialism in the history of Turkey [the successor state to the Ottoman Empire]. That is only laughable to anyone with an elementary knowledge of history. For one, Gormez should explain why millions of Turks every day celebrate the "conquest of [Christian] Istanbul" by Muslim Ottomans. Such political controversies as the Pope's speech always offer golden opportunities to Turkish officials who would not miss exploiting them in order to look pretty to an Islamist government and hope for a brighter career. They usually make a weird statement, make sure it gets published, and lots of public attention, so that the very important men in Ankara could privately or publicly hail them. Turkey is never short of (centrally-appointed, not elected) governors with eccentric opinions. The Pope's speech lavishly enabled someone serving in one of Turkey's most remote and poorest corners to prove his loyalty to the Islamists in Ankara. In a public speech, the governor of Turkey's easternmost province, Kars, invited Pope Francis to -- convert! The governor kindly invited the leader of the Catholic world to a Muslim mass in his city and said: "May God grant him the right path [to Islam]." This author has no idea if the Pope would take that opportunity and convert to Islam. But it is certain that Turkey's Islamists have brought a playful new dimension to their country's culture of denial.